No visit to Aix en Provence would ever be complete without tasting (and falling in love) the unique almond paste candy known as Calissons. They are delicious and hard to find, yet making them is not so difficult, taking the time to make them from scratch is worth the effort, so you can now easily eat them at home. Cook’s note: This recipe uses raw eggs. Children, elderly people, pregnant women, and anyone with a suppressed immune system are advised to avoid this food. 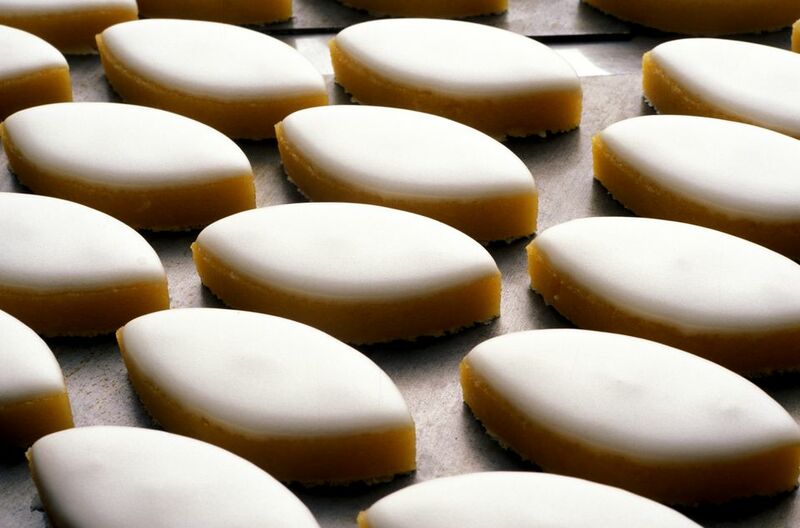 These delightful candies are also known as Calissons d'Aix. Soak the melon and orange peel in the almond liqueur and orange flour water, cover and leave them overnight. The next day, drain and discard the soaking liquid. Line a tray of oval-shaped candy molds with plastic wrap and set aside. Cream the egg yolks, 4 oz sugar, and ground almonds together in a baking bowl. In a separate bowl, beat the heavy cream until soft peaks form taking care to not overmix. Gently fold the whipped cream and plumped fruits into the egg mixture. You should do this as gently as possible to avoid knocing the air from the cream. Fill candy molds with the nougat batter and freeze for a couple of hours until the candies are firm to the touch. Carefully remove them from the molds. Put the confectioners sugar into a small bowl. Roll each nougat shape in the sugar, if desired, before serving. To store the Calissons, wrap them loosely in a little greaseproof paper and store in an airtight tin. They will not keep for long, and best eaten fresh. To stay true to the origins and nature of the sweet, and retain its authenticity, it is best to not mess with the recipe. The origins of a Calisson in medieval Italy are bound to the ingredients, particularly to the almonds. The candied fruits are also reminiscent of what was then available. Why change something this good, let it be the way it was. This calissons recipe makes approximately 12 servings.